Figure 1.--Children for the most part are lost to history. Historians rarely address them, although with the increasing populrityof social history we see somne attention to history. We see few images of children in ancient art and even with the development of Western art, images of children compose only a small portion of available works. And most are portraits with limited historiucal context. Only with the development of photography (1839) do the image of children increase significantly. We begin to see photogrphs which show children in a histoticl context (1860s) and this gradually increased with technological advances in photography. 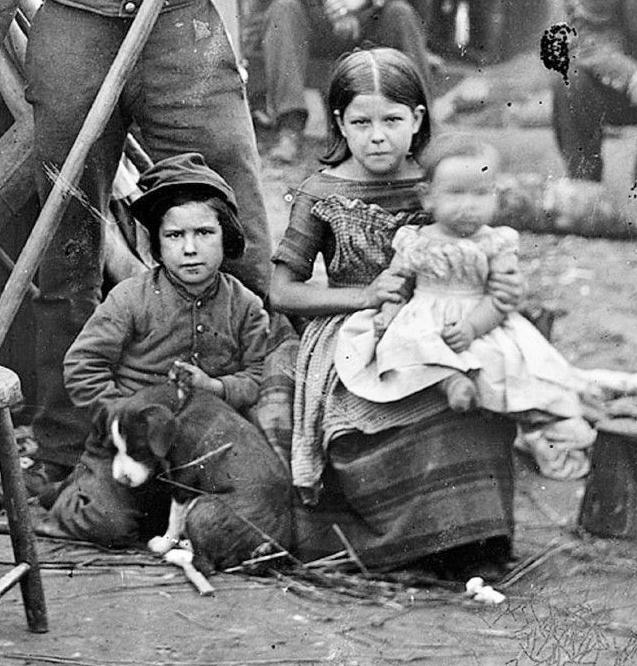 These two unidentified Pennsylvania children are shown during 1862 in a Federal military camp during the American Civil War. I may have been at about the time that Robert E. Lee and the Army of Northern Virginia was headed their way. Notice the puppy which show how children throughout the ages exhibit many similarities. Our website was founded as a fashion site by an old friemd, Chris Wagner. Knowing that I was interested in photoraphy and history , he asked me tonhelpmwith the site. Anf for some time we primarily worked on fashion as we archived thousands of images, mostly old photographs. Over time I began to think that we could make better use of these images than just assessing fashion trends. We have continued to work on fashion and many of our readers are porimarily interested in fashion. Over time, however, we have begun to also focus on history and a range pf other topics such as anthroology, archeology, economics, sociology, science, and many other topics. One reason I got interested in this effort was whn I was teaching school, my students would ask questions about what life was like for children in the various chronological periods we were studying. I was unprepared for this and in the pre-internet dau=ys, this was something that was not easy to research. thus have addressed history with a unique ficus, how children affected history or were affected by history. This is something often glossed over with the common focus on the grat men amnd mow women of the day. On some topics children were not involved or we have not been able o find ibformation about them, but this is information we are constantly seeking and our growing photographic archive is helping to illustrate he various images we have found. One of the cornerstones of humam civilization is the domestication of animals. Human civilization is barely conceivable without domesticated animals, although civilization in the Americas developed wkith much less aid of domesticated animals. Geneticists in recent years have made importnt discoveries bout the domestication process. The domestication actually began before civilization. The dog appears to be the first animal man domesticated. They proved useful in helping the hunts of hunter gthers. It appears that dogs first tamed and bred in China. Geneticists report that about almost all (perhaps 95 percent) of modern dogs have descended from just a few wild dogs domesticate in China. This is interesting because agriculture and civilization developed last in China of the four great river valley civilizations. Dogs of course were espcially useful to huntergaters more than agriculturists. Animal husbandry or the raising of domesticated animals is believed to have appears to have occurred at about the same time agriculture began launching civilization. Two of the most important were goats and sheep were domesticated in the Middle East (abour 10,000 BC). Swine were domesticated from Eurasian wild boar (Sus scrofa). Humans in both Europe and Asia apear to habe domesticatied wild boar independently (about 7.000 BC). Animal Husbandry is of enormous economic importance. They gave humans access to important animal resources using pasture rather than having to expend time and energy in hunting them down. The horse was another important domesticated animal, but of more military as well as economic importance. Geneticists now believe that the horse was first domesticated on the Eurasian Steppe, probably in what is now the Ukraine (probsnly about 4000-3500 BC). The donkey (burro) and camel proved valuable beasts of burden making trade possible over distances like the Silk Road. The humble donkey may be thd most underappreciatedoif all animls. Not only was the donkey important in agriculture and trade, it was commonly unappreciated as a vital animal in warfare. The donkey actually made war, as opposed to localized raiding, possible. An army of any size could not move any significan distance without a way of transporting weapons, food, water, and other supplies. And the donkey provided a way to move these supplies. Geneticists believe that wild asses in northeast Africa are the ancestors of modern donkeys. Many famous and not so famous men remember the clothing and hair styles they wore as boys. Or they are recorded in family photographs. The boyhood experiences of these individuals are often recorded better than those of ordinary people. Thus their boyhood experiences are an important vsource of sociological information a well as offering important biographical insights. Not so many years ago it was all up to mom how junior was dressed. In some cases, especially in the late 19th and early 20th Century, moms in Europe and America let their imaginations run wild, choosing elaborate Fauntleroy and kilt outfits for their darling sons. The wife in affluent families rarely worked and thus she had a great deal of time, and in some cases the assistance of nannies and governesses, to see to the care and dressing of their children. The results were very little boys kept in dresses. Ever after they passed out of dresses, little and not little boys done up in dress-like tunics and kilts and lacy Fauntleroy suits and kilts as well as more manly sailor suits. Children are not generally associated with history and great events. History of course is not just a series of great events. This is a theme we have pursued throughout HBC. Great events are, however, clearly important. Children are often most affected by those events. Sometimes they have even been targets of those events. Not infrequently, children have also played important roles in shaping those events. Young people with fresh outlooks unencumbered by the weight of socail conventions have often enspired or promoted important social movements, often but not always for the good. Some images of children have also become symbols of great events. HBC is building a chronology describing the development of boys' clothing styles. Our focus is on the modern era. Yet it is not possibe to fully understand the modern era without an assessment of earlier periods. Thus we have decided to provide some basic background history on human civilization from the dawn of man. We will not pursue these early epocs in the same detail as the modern era, but we believe that it is esential to look at ancient civilizations to begin our assessment of clothing and fashion. We also think that a basic historical perspective is essential to understand the wider cultural context needed to under stand not only fashion, but economics and many other deciplines. We have been very concerned in recent years over the politization of so much of the history appearing in the media and popular culture. Here we will endevor to provide a fact-based assessment of the historical experience. Climatology is the study of climate or long term weather conditions (atmospheric pressure and composition, cloud cover, humidity, precipitation, temperture, winds, and other factors). It is an enormously complex discipline because so many different phernomenon affect climate. Climatoligists have to consider not only celestial phenomenon (such as moon and sun gravitation and solar sunspots) as well as a range of earthly phenomenon, including those in the atmosphere, hydrosphere (oceans), cryosphere (frozen areas), land surface, subsurface (volconology is important here), and biosphere. Many of these phenomenon and spheres are poorly researched and understood. Climatolgy is now at the center of the climate change debate. In recent years, climate change has become a mantra of liberal politicans. As House speaker Nancy Palozi explains, "We have a planet to save." In the West, liberal and Socialist politicans have been the strongest supporters of enormnously expensive climate change legislation. The issue does not, however, cut nealy accross traditionsal left-right political cleviages. Thus Green parties have achieved considerable support in Europe, especially Germany. Climate has affected both history and clothing in many ways. Some argue that changing cliate was a factor in forcing primates down from the trees, out of the forest and on to the African savanah resulted in the development of bipedalism, the destinctibe characteristic of homonoids. We now know that homonoids developed bipedialism before they emerged from the forest. The impact of climate on history is enense and well documented and this has continued to our modern age. Climate is an importat factor affecting clothing. One major impact on clothing is utlity. While clothing has been influenced by other factors such as fashion, the first major influence nust have been utility, especially protection from cold weather. As human society became increasingly sophisticated, fashion influences have become increasingly important. Climate continues, however, to be an important factor. We have seasonal discussions on many HBC pages. Disease is not a topic that has commonly been treated in detail by historians. Some historians have begun to give it more attention. Here Jeremy Diamond's Gun's, Steel, and Germs has powerfully persued the importance of disease in history. The modren threat of both bio-terrorism and the rapid movement of disease vectors as a result of modern communications has drawn further interest in the subject. We now know that the plague had a huge impact on modern Europe. We also know that smallpox and other diseases virtually wide out Native American populations. The topic is of some interest to HBC, both because of its important historical role, but also because of the role children have played in deceloping cures. One other interesting topic is the development of polio in the 20th century and the huge impact it had on children. HBC is primarily a history site. Marxists would say that economics fundamentally drives history. HBC believes that this is a gross over simplification, but of course economics is a powerful force that affects history, perhaps even the single most powerful force. It is clearly, however, not the only force and often not even the dominant force. Its importance, however, means that it has to be considered by historians. As a result, we will create some pages to address major economic trends such a feudalism, slavery, the industrial revolution, child labor, the depression, globelization, and other developments. Economics is especially important to HBC as the production of textile has been a major economic activity since the dawn of civilization and in fact was at the heart of the Industrial Revolution--the single most important development since the Agricultural Revolution thst created civilization.. Ethnicity is another fascinating topic. We have done quite a bit of work on ethnicity, but have not yet approached the topic in a comprehensive fashion. Ethnicity has played a role in history, but this seems to be especially true in the modern age as concepts of race and narionality have plyed an increaingly prominent role. We have an extensive Native American section. Most of the other ethnicity pages are in the individual country pages which we will eventually link here. We also have tribal pages for both Africa and the Americas. There are tribal groups in Asia,the MuddkeEast and North Africa, and Oceania, but we have done less work there. This is a topic that until recently could not be studied in a scientific manner, especially during historical periods. DNA research has opened new avenus of investigation. Ethnicity is related to race and often confused with race. There are, however, differences. Biological and sociological factors are involved. Race refers to a person's physical appearance, based on biological inheritance, characteristics like skin color, eye color, hair color, bone/jaw structure etc. Ethnicity, on the other hand, relates to cultural factors such as nationality, culture, ancestry, language and beliefs. As the cultural factors are developed in given areas, they often correlate with race, but are not dependent on it. Thus Americans kidnaped at a young age by Native Americans or foreign children adoped at a young age by Americans or fully enculturated into the culture in which they are raised. The story of freedom is arguavly the key epic of humanity. Here we are not taling avout a history of freedom because freedom has so many ramofications beyound just history, sonoffs in art, economics, mecicie, political, science, and much more, in sum total the saga of human accomplishment. Karl Marx argued that economics has been the driving force of human history. We argue that it is freedom that has been resomsible for the great advances in humany history. This does not mean that aimportant afdvances can not be made in the absence of freedom. Important accomplidhments occurred under Egyptian pharoes and Chinese emperors. Modern mathematics came from India. But it is in the tiny Greek states that the comcet of freedom and Western civilization was born--ironic because slavery was an important part of pat of classical civilization in both Greece and Rome, but the great arc of Wwstern civilzation has been toward freedom. And through many trials and tribulations, reverses and advances has been an advancement of freedom. And as a result Western civilization has forged modernity. Religion is a factor that needs to be considred. Religions have impeded freedpm. And some have ober time both impeded and promoted freddom. This is tru of Christianity whose role in the the development of the concept of freedom and the achievement of free socities is poorly understood. Despte the fact that China was for much of histirt the richest and most technologically productive society in the world, China did not create modernity. Democracy capitalism, the industrial revolution, effective medicine, and science are all creations of Western civilization. It has been responsible not only for political democracuy, but the economics of free market capitalism. Freedom of course is not the only current that flows in Western Civilization, but the great Totalitarian Powers, using Marx's terns were thrown on the 'ash can of history' by the force of freedom mustered by the liberal democracies in the form of political democracy abd economic free market capitalism, including the Soviet Union which his ideology helped create. It is no accident that the most prosperous countries of the world are liberal democracies with vibrant private economic sectors. As a result, migrants by the millions from socities who lack freedom, taking their lives in their hands to reach the countries who have instituionlized freedom. In the 21st century new question has arisen in the saga of freedom, China is by using ftree market capitalism to develop a prosperous society, but with totalitarian controls. The outcome of this new approch will in large part dominate the history of the 21st century as will the competition between liberal democracy and Islamic fundamentalism, a rinteration of a the medival mind in a modrn totalitrin guise.. Since greade school I have been fascinated by geography. Geography is not an easy disipline to define in part because of all the different braches of geography and the activities with which geograophers are involved. The basic definition is smething along the line of the study of the aerial differentiation of the earth's surface. People from ancient times have written about geography. Only since World War II, however, were plate tectonics understood which are the primary mechanism of geological change that are reponsible for geographic features. What originally attracted me to geography was the vast physical and human differences around the world. Only gradually did I become aware of how important geography was in so many aspects of human endevor. This has included both history and clothing, the two major aspects of our HBC website. Geography has affected much more, including climate, cultural, and economics. It has also affected human physiological development which left Native Americans dangeously vulnerable to Old World diseases. Many HBC pages touch on geography and we want to create a page to help HBC readers interested in geography find the pages we have developed. HBC is fortunate to have a geographer among its contributors. He tells us, "I have a Ph.D in what I like to think of as "Historical Geography." I was interested in trying to recreate landscapes (physical and cultural) from the past, and examine factors that impacted and shaped these landscapes. Geographers do other things, of course, such as develop Geographical Information Systems (GISs), hazards research, etc. I am happy to report that university geography departments have grown in size since I was in school. Unfortunately, there has been a trend to merge geography with other disciplines into "social studies". Geographical Awareness quizzes have shown a need to go back to basics, because students have little knowledge of place names these days. School budgets and cutbacks in staff have been a problem." Human nature is a term which refers to the intrinic distinguishing characteristics of humanity apart from culture. We know that adukts behave differently affected by the cultures in which thy were raised. Infants could theoretically be placed in any culture and do perfectly well despite their origins. This is a much more complicated topic than it may seem because some critical human behaviors such as language are believed to be learned at critical age periods and once missed the ability to learn lanuage is greatly impaired. This means that human nature can not be completelty separated from culture. Man has evolved to be a cultural being and thus culture is an essential part of human nature. This can be seem in feral children. The subject of human nature has been one which has fascinated man from the dawn of civiization. A wide range of issues emerged besides trying to separate intrinsic behaviors from culture. Issues include what intrinsic behaviors are, what causes them nd how they are transmitted, and how fixed human nature is. These questions are among the oldest and deepest questions in philosophy. And for most of human history, they were considered before the modern science of genetics and DNA were understood. The answers are, however, are not just theoretical, phuilosophical musings. They have vast implications in ethics, politics, economics, child rearing, theology, and ther areas. Human nature has been seen as both a justification for norms of conduct as well as presenting obstacles on living a good life or building a society. The Enligtenment ebraced human nature and idealized the nobel savage. This is seen in the American Declaration of Independence. Marxism takes a different approach. The Soviet Union sought to supress human nature and remake citizens as the new, improved Soviet Man which was probably a major reason the Soviet Union ultimately failed. Ideology is a system of ideas and ideals, especially one that forms the basis of economic or political theory and policy. Often political parties expose ideologies. Another group of ideas is theology asexpoused by religious gtoups/ Some religions like Islam also expouse political ideology. This has changed over time. The Cgristinity that emerged from the Roman Empire expoused the political ideology of absolutism, but ober time Christianity withdrew from the political realm. Over time there hace been a huge number of different economic, political, and social system. And political philosophers have written extensively on even more political system including utopia and idealized systemd. Political scientusts have attmpted to develop a 'ist of basic ideologies in which the various historical sociries since the appearance of civilization in Mesopotamia nerly 10 millenia ago can be grouped. A basic grouping on which many historians can agree include five major politicl ideologies: Anarchism, Absolutism, Liberalism, Conservatism, and Socialism. In actual practice, some of these ideologies seem to bleed together, like democratic socialist, and Marxist-Lennist socialism, but over time they have been mutually exclusive in actual societies. It is notable how these ideologies except for absolutism rose in the West. As part of our history discussions, we thought it would be helpful to create a section on nationl leaders. For most of history this meant hereditary monarchial leasers with rare exceptions such as Greeks and Romans. As a result we have an extensive royalty section. Of course monarchial systems are not purely hereditart as there are palace coups and civil wars which replaced one dynasty with another, but for the most part the vast majority od sucessions were done on an hereditary basis, justifed by divine right. We are most familiar with European monrchies, but this in fact was a system adopted throughout the world and over the vast span of human history. The reason for this was it was one way to stabalize seccession and avoid war and disorder when a monarch died. In modern times non-monarchial systems have become more common with elections determning leaders. The first modern democracy was the United States. The root of American democracy of course was Britain, although at the ime of the american Revolution, very few Britons could vote. The orld's latgest democracy is India which despite this toyed with the Soviet Union after independnce. Interestingly while democracyis surely the greatest achievement of India, many Indians do not want to admit the British roots. Gradually elections began to be held in more andmore coutries. Unfortunately many elctions are elections in name over and are mere sunterfuges and controoled. This has varied, but was quite common in the post-World War II decoloization of the Third World. The idea of elections, however, are so poweful that even dictators at least pretended to have elections. The arc of history is for real elections to becomne more common around the world, although there are still many coutries, including important countries that do not hold real elections suh as China and Russia. The history of law is essentially the history of civilization. Even primitive socities have law, although they are not written down. They may be largely traditions. As more sphisticated socities developed with the advent of agriculture, an actual legal code was required to resolve complicated legal questions concerning business and property. The Babylonian king Hamarabi finally made the first step toward a written code. This was a huge step as law based on a written code was less arbitrary and more fair to all concerned. One of the great gifts of Rome was that of law. Roman law played a major role in the eventual emergence of the West. The classical tradition was lost for centuries after the fall of Rome. The Islamic legal system or shria based on the Koran was in the 7th century a progressuve development. The problem with Islamic Law is that Muslims see the Koran as God's final relevation to man and beyond question. Thus with a medieval foundation that can not be questioned are amended, there is an inflexibility in Islamic law making adjustment to the modern world difficult if not impossible. . Emerging from the European Medieval era was English common law, England's great gift to America and its other colonies. English common law was a necessary comcomitant of capitalism which allowed the West to create the modern world. France had nothing like English common law. Louis XIV famously said, "I am the state". Napoleon is one of the great military geniueses of all time and committed to autocracy, but his great achievement was the Code Napoleon which for the first time presented France with a modern legal system. The importance of law is often forgotten in our modern world, but there is a strong correlation between economic prosperity and the rule of law. Nationalism is a powerful concept which has had a huge impact on modern history. At times it has had racial connotations, but this has not always been the case. Under the Fascists in the 20th century it took a particularly virulent turn. We have noted several instances of mixed national background and the struggles associated for the children involved. Some Europeans in the 19th and early 20th century looked down on America for its mixed ancestry wondering if this constituted the basis for a true nation. Nationalism is a belief that countries or nations whether defined (ethnically or culturally) are the primary units of humam society. Proponents of nationalism make a range of cultural, economic, and political claims based upon their comminment to their country and its service. The fundamental claim is that the nation as defined is the sole only legitimate basis for the any political state. Furthermore each nation believes that it is entitled to its own political state and self determination. Here nations come in conflict because many nations have overlapping territorial claims and some nations fall totally within the territory of larger states. Complications arise because a nation usually consists of an ethnic, religious, or cultural community while a state is a soverign political enitentity. Modern nationalism is a largely European concept, although it is now most intense in the countries outside the European Union. European states until the French Revolution were largely multi-ethnic kingdoms and empires. Even in unifoed countries like Britain France, and Spain there was considrable wthnic and linguistic diversity. The wars of the French Revolution and Napoleonic era inspired the growth of nationalism, often due to the opposition to French occupation. This led to the unification of Italy and Germny as well to the desore for states among the barious national groups of central and eastern Europe. The nationalism of the 19th century led to the terrible tragedies of Worl;d War I and II. As a result, the concept has come into disrepute in Europe. In contrast it is often a highly effective rallying cry to the people of the Third World. Religion is an organized set of beliefs explaining the cause, operation, an purpose of life and the uiverse. The development of religion is one of the distinguishing characteristics of mandkind. Most religions have associated moral codes. Religion has been a major force in history. It is unclear at what stage in human history religion developed. Early religions were normally animistic and polytheistic in nature. The adoption of monotheism is seen as an advanced important stage in human development. Religions involve ritual and devotional behavior . Distinctive clothes and costumes are adopted by many religions. European and American Children's fashions, especially in the 19th and early 20th centuries were strongly influenced by the way royal families dressed their children. Queen Victoria was especially influential as so many of her children and grandchildren maired into royal familes throught Europe. Kaiser Wilhelm II, for example, was the Queen's grandson. While the British House of Windsor was the most influential in this regard, other royal families also had great influence, at least in their own countries. An important topic is modern science in the making the modern world. Quite a number of issues need to be considered. Science has prevented and cured disease as well as revolutionized the world's economy and productive capacity, allowing large numbers of people to lead comfortable lives for the first time in history. This of course is obvious. Less obvious is the image of modern science. When I began teaching school, I was surprised to find that science was among the least popular subjects with American students. I was suprised at this because as a boy I found science fascinating. We are not entirely sure why this was, but suspect teaching methods were a factor. Another observation is the image of science among young people. Given the fact that scientists and inventors played a major role in building modern industrial states, you would think scientists would have very positive images. But this is often not the case. Here we suspect the popular media is a factor. To the extent that scientists appear in cartoons, movies, and television--the "mad" scientist is a very common character. Another factor is religion which sometimes see science as a threat. From time immemorial human scociety has stratified ifself. Social hierarchies were present in hunter-gathering society and became much more prevalent with the development of agriculture and civilization. Only in our modern age has human society began to seriously address the issues of class with yet limited success. Any assessment of clothing and fashion should include all strata of society. And until modern times the lower strata of society were by far the most numerous. This presents a problem for HBC because the available imagery often focuses on the upper classes. With ancient civilizations images of children are rare and those of peasant children almost not existant. Even in our modern age, photographs tend to be much more available for the middle class and wealthy than the very poor who often could not afford photographs. And ofcourse catalogs focused on clients with money to spend. Readers need to bear this basic problem in mind when using HBC. We have, however, attempted to address clothing and other issues associated with the less-affluent classes. And on many HBC pages on specific styles you will find a social class paragraph.